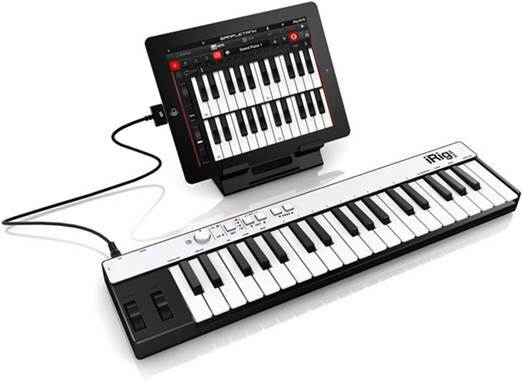 iRig KEYS is a three-octave (37-key) keyboard that plugs into Macs, via USB, and iOS devices, via the 30-pin Dock. If you have a newer device with Lightning, you’ll need Apple’s $38 30-pin adapter, but then you’ll need it for about a zillion other things as well, so you might as well bite the bullet and get yourself one. Designed for portability, the iRig is powered solely by its data cable, which with a Mac just means there’s no annoying power cord and adaptor to worry about, but with an iPhone, iPod touch or iPad means you’ll be draining the battery a little faster than usual while it’s in use. It doesn’t leach power all the time it’s plugged in, but switches on automatically when an app is running that’s capable of receiving incoming MIDI signals. There’s no separate on/off switch. The problem, of course, is that your iOS device only has one port, so you can’t charge it while the keyboard is connected; if the battery gets low, you’ll have to stop playing and recharge before continuing with your composition. 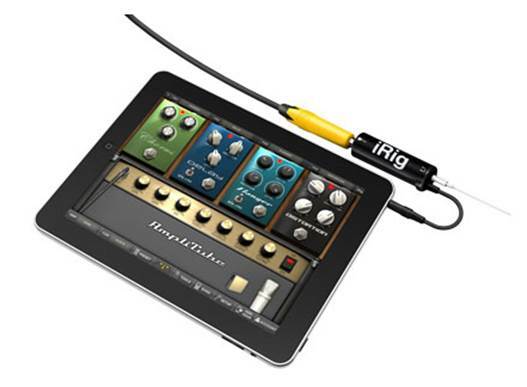 The iRig works well with GarageBand and other music apps that have MIDI capability. Cheap or free piano apps that just play sounds from an on-screen keyboard won’t be able to see it, but there are lots of proper MIDI-aware music apps at all prices. You can also download IK’s iGrand Piano app, which has free version; we’ll be reviewing this next issue. Mac users get a copy of SampleTank 2 L, a standalone or plug-in sample player. The iRig is best when used in conjunction with GarageBand. The keys may not be weighted – we wouldn’t expect that in a keyboard of this size but they are velocity-sensitive. That doesn’t mean, however, that they have the sensitivity to cope with subtle classical material: playing quietly requires a lightness of touch that’s almost impossible to achieve. While you can choose from three different software settings (light, normal and heavy), the hardware isn’t really up to supporting a delicate style. Plenty of other features distract from this shortcoming. There are separate controls for volume and program changes as well as the usual pitch and modulation wheels. Pressing both Octave buttons enters Edit mode, in which the keys themselves can be used to define MIDI channels, transpose the pitch, set the velocity and so on. There’s a single socket for a sustain pedal or expression pedal, and four user definable keys that store all the parameters for the current session. This is particularly useful when switching between, say, a piano with light velocity sensitivity in a high register, and a heavier touch and lower octave for s bass part. At 50x12x3cm, iRig KEYS is compact enough to fit in an air-line carry-on bag, with no separate power supply to worry about. The three-octave limitation is eased by up/down octave buttons that can shift two octaves, although obviously not all at once. If you want to play a piano piece with left and right-hand parts, you’ll probably need to record them separately. The free version of iGrand Piano comes with three sample pieces of music, including Mozart’s familiar piano sonata K545. Whether because it was recorded on IK’s own short keyboard or for came other reason, the top notes in the night-hand part are missing. Not fixing this could be seen as a kind of honesty, but we have to wonder if they couldn’t have chosen a different piece. iRig KEYS is far from being the perfect keyboard, then, but its compactness and ease of connection make it a great travel companion. Although lacking in dynamic subtlety, it’s also vastly easier to play than the on-screen keyboards in GarageBand and other apps, and far more sensitive than Apple’s gimmicky attempt to simulate velocity sensing using the accelerometer. It’s a handy accompaniment to almost any decent music app, making it an ideal present for the Apple-equipped music enthusiast. Created by French designer David Turpin, the POP Phone is a traditional GPO-style phone handset that connects to your iPhone for voice calls or to any iOS or OS X device for FaceTime, Skype and other VoIP services. The latest Bluetooth version works wirelessly, but comes with a suitably long and curly detachable USB cable for charging. Whether you want to keep radiation further from your brain, find a phone receiver more comfortable to hold than an aluminium rectangle, or just like the retro vibe, it’s an attractive accessory. It’s also gratifyingly easy to use. There’s one central button (with plus and minus keys either side); we guessed that holding this down for a couple of seconds would enable Bluetooth pairing, and sure enough our iPhone found it immediately. Calling the iPhone then produced a startlingly loud bell tone from the POP, and clicking the button picked up the call; clicking again ended it. We then turned down the ring volume using the minus key. Clicking the button when not on a call activates Siri, just like holding the Home button (for obvious reasons, this will only work if you have no passcode lock, or Settings Passcode Lock Allow Access When Locked: Siri turned on), so we could voice dial; this will also work with Voice Control on pre-Siri iPhones. The POP also worked fine with FaceTime on both the iPhone and an iPad mini, except that when we received a FaceTime call, only the device ringtone was activated, not the handsets. Either way, call quality was very clear. It can’t hurt that the POP’s micro phone points straight at your mouth. We’ve seen knock-offs of the POP not only online but in shops, at a similar price to the original, so if you’re not buying direct from Native Union, check what you’re getting. The real thing is precisely made, beautifully balanced, and has a silky silicone texture. The POP comes with a felt mat to put it down on, but a matching POP Base ($18) is also available. Or you can choose the POP Desk instead ($67), which gives you the wired version of the POP, with curly headphone jack cable, and a metal cradle that holds your iPhone sized for 4/4S at an angle beside the hand-set. The wired POP by itself is also still available at $37.